Below you fill find all funeral homes and cemeteries in or near Greenville. Greenville is also known as: Butler County / Greenville city. Their current mayor is Mayor Dexter McLendon. Zip codes in the city: 36037. Some of the notable people born here have been: Beth Chapman (politician), Phil Hancock (golfer), and Marty Raybon (singer and singer-songwriter). Greenville is a city in Butler County, Alabama, United States. At the 2010 census, the population was 8,135. 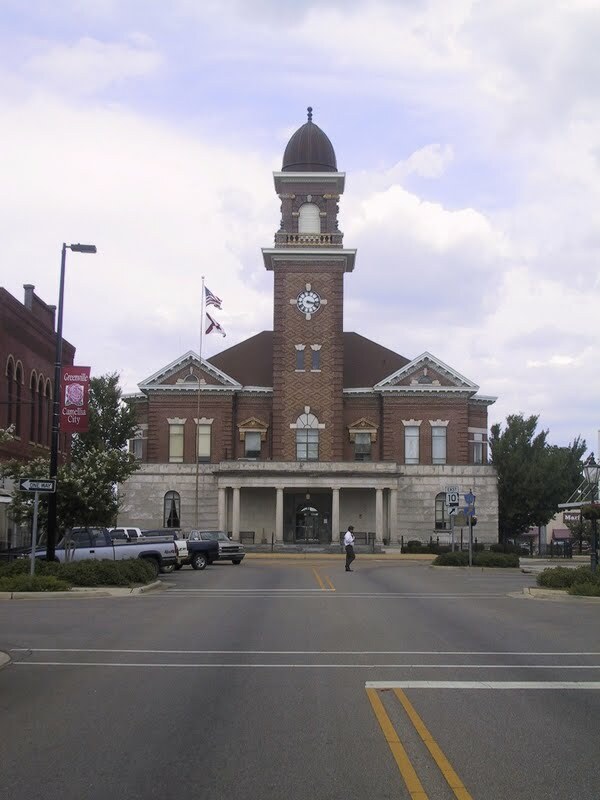 The city is the county seat of Butler County and is known as the Camellia City. The movement to change the official Alabama state flower from the goldenrod to the camellia originated in Greenville. It was reported on November 28th, 2018 that Claude Crenshaw perished in Erie, Pennsylvania. Crenshaw was 73 years old and was born in Greenville, AL. Send flowers to share your condolences and honor Claude's life. It was reported by Hartford Courant on November 15th, 2018 that Joe L Cooper passed on in New Britain, Connecticut. Cooper was 75 years old and was born in Greenville, AL. Send flowers to express your sympathy and honor Joe L's life. It was reported by The Advocate on September 29th, 2018 that Nolan Jr Womack passed on in Heath, Ohio. Womack was 80 years old and was born in Greenville, AL. Send flowers to express your sympathy and honor Nolan Jr's life. It was disclosed on August 26th, 2018 that Lillie B Stallings-McClain (Crayton) passed on in Niagara Falls, New York. Ms. Stallings-McClain was 88 years old and was born in Greenville, AL. Send flowers to express your sympathy and honor Lillie B's life. It was reported on July 8th, 2018 that Mary L Pugh passed on in Atlanta, Georgia. Pugh was 80 years old and was born in Greenville, AL. Send flowers to express your sorrow and honor Mary L's life. It was reported on June 28th, 2018 that Lavern "Buster" Bones passed away in Buffalo, New York. Bones was 74 years old and was born in Greenville, AL. Send flowers to share your condolences and honor Lavern "Buster"'s life. It was noted on June 19th, 2018 that Terry L Sr "Herb" Herbert died in Niagara Falls, New York. Herbert was 67 years old and was born in Greenville, AL. Send flowers to share your condolences and honor Terry L Sr "Herb"'s life. It was reported on December 6th, 2017 that Jimmie Powell died in Buffalo, New York. Powell was 82 years old and was born in Greenville, AL. Send flowers to share your condolences and honor Jimmie's life. It was reported on February 22nd, 2017 that Katie M Payne (Crayton) passed on in North Tonawanda, New York. Ms. Payne was 91 years old and was born in Greenville, AL. Send flowers to share your condolences and honor Katie M's life. It was revealed on January 18th, 2017 that Lennie M Hamilton (Jackson) died in Niagara Falls, New York. Ms. Hamilton was 82 years old and was born in Greenville, AL. Send flowers to express your sympathy and honor Lennie M's life. At the 2000 census, the population was 7,228. Greenville is a city in Butler County, Alabama County, Alabama, United States. The push to change the state flower from the goldenrod to the camellia originated in Greenville. The city is the county seat of Butler County, Alabama County and is known as the Camellia City, the state flower of Alabama. . The official website for the city of Greenville is http://www.greenville-alabama.com. Listing all funeral homes in Greenville, Alabama so you can easily send flowers to any location (same day delivery) or find any funeral service. Listing all funeral homes in Greenville, Ohio so you can easily send flowers to any location (same day delivery) or find any funeral service. We work with local florists and flower shops to offer same day delivery. You will find budget sympathy flowers in Greenville here. Our funeral flowers are cheap in price but not in value.